George gives the address of 35 Bolsover Road, but they end up staying at 224 Petre Street where Elizabeth and her mother lived, as George Higgins Exton (my father) was born there in 1906. Petre Street was a very poor area situated near all the Sheffield Steel Works. George William dies in 1932 and Elizabeth later remarries to John T. Beard in 1933. 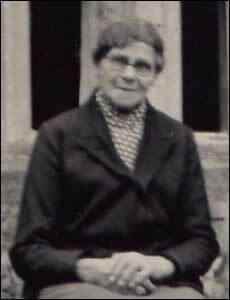 Elizabeth out lives her second husband and moves in with her only son George Higgins Exton, at 40 Tapton Hill Road, Crosspool, Sheffield, until her death in 1955. This photograph was taken around 1946. Born 1870, Elizabeth was about 76 years old at the time, and lived to be nearly 85. As far as I can remember (I was about 9 when she died) she always wore black attire all the time she lived with us, as this photo shows.